Wage theft has become business-as-usual. 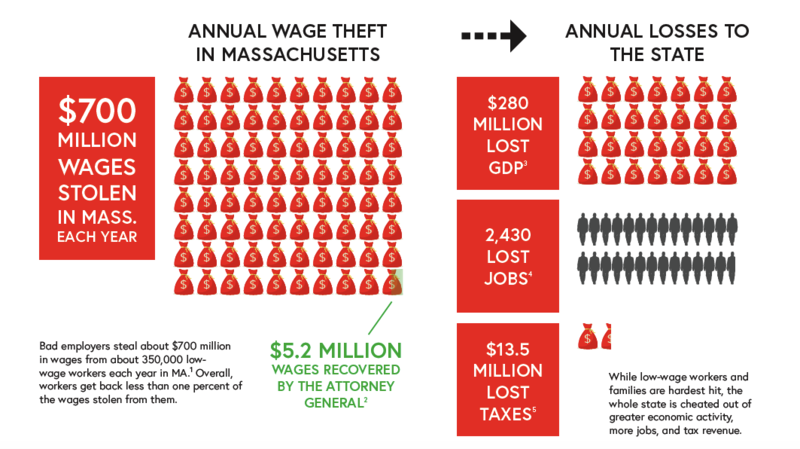 In our modern economy where bad employers increasingly use subcontracting and outsourcing deals to dodge responsibility for their workers, the epidemic of wage theft has overwhelmed the capacity of our existing labor laws and enforcement mechanisms. An act to prevent wage theft and promote employer accountability is a bill that will clarify who is ultimately responsible for upholding labor standards, and also empower the Attorney General with additional tools to hold violators fully accountable to recover what is wrongfully taken from workers and the state. Passing the bill will uplift low-wage workers and families: it will strengthen the state’s economy: and it will ensure Massachusetts remains the leader it has always been in passing strong labor laws and workplace protections.